Atlanta Sprinkler Repair 770-900-9862 Maintaining your irrigation system is very important if you are going to keep your system running at 100% efficiency. If you are like most people, you have more important things to worry about than your underground sprinkler system. Just about everyone that has a lawn sprinkler systems in Atlanta area tends to neglect winterizing and annual check ups. The reason for this is our climate. We in Atlanta may or may not even get a real winter. But if we do get a rare cold spell that drops down in the say 15 or 20 degree range for a couple of days, it could do serious damage to you irrigation system. Most of our new customers assume that all they have to do is call a sprinkler repair company when a rotor or spray-head is spraying in the wrong direction, or one of them is broken and water is shooting straight up in the air. At Atlanta Sprinkler Repair we teach our customers every thing that we can about how their system works, and the art of “preventive maintenance”. So many people depend on the landscaper to take care of their irrigation system, and that could very easily come back and cost them dearly (Dollar Wise) in the future. If you have a very old irrigation system it is extremely possible that you have heads that need to be raised or lowered to keep them working efficiently. You may have noticed a rotor or spray-head in your yard that is either too high in the ground, or too low. This is caused by the many years of erosion. If a rotor is too high it could be damaged by a lawn mower, a car if the head is by the drive way, children at play, or even sometimes your pets like to dig them up and chew on them. On the other hand, if you have a head that is too low in the ground, it may get buried below the surface of the ground and not come up all the way. 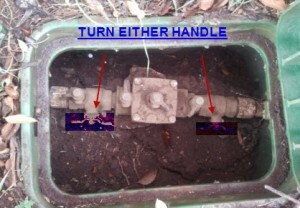 We at Atlanta Sprinkler Repair can fix this problem for you. If you could see your irrigation system that is below the soil, you would see a maze of pipes, electrical wiring, electric valves, an emergency shut off valve, and a “brass duel check valve” or a “back flow” that prevents your irrigation water from contaminating your drinking water. You should ask yourself this question…Do I really want a landscaper working on my irrigation system?